Venezuelan President Nicolas Maduro gestures during a press conference at Miraflores Presidential Palace, Caracas, Jan. 9, 2019 and the opposition leader Juan Guaido addresses a crowd during a mass opposition rally, Caracas, Jan. 23, 2019. Amid the ongoing U.S.-led campaign against Venezuela's democratically elected President Nicolas Maduro, Venezuelan authorities announced a cache of weapons, allegedly delivered from the U.S., were seized yesterday, according to reports. High-caliber ammunition, 19 rifles and 118 magazines, as well as 90 radios and six mobile phones were discovered at the storage yard of Arturo Michelena International Airport in the Venezuelan city of Valencia, the country's Interior Minister said in a tweet. The U.S.-made weapons were reportedly sent from Miami, Florida, on Feb. 3, the ministry also said. Maduro dismissed a U.S. attempt to send relief aid to the crisis-hit country, saying that the humanitarian aid would be the forerunner of a U.S.-led invasion, insisting, "No one will enter, not one invading soldier." The aid delivery was being coordinated by opposition leader Juan Guaido, who has declared himself interim president of the oil-rich country. Guaido, meanwhile, accused Venezuelan military officers of blocking a bridge on the border with Colombia ahead of an anticipated humanitarian aid shipment, claiming that up to 300,000 people face death if the aid is not delivered. Earlier Tuesday the opposition-dominated National Assembly warned the armed forces, which make up much of Maduro's power base, not to cross a "red line" by blocking aid. The U.S., which has not ruled out a military intervention in crisis-wracked Venezuela, was the first to recognize Guaido as acting president, followed by a dozen Latin American countries. In his State of the Union address Tuesday night, President Donald Trump reaffirmed U.S. support for Guaido, saying, "We stand with the Venezuelan people in their noble quest for freedom." Trump earlier warned he could use military force in Venezuela if Maduro does not hand over power. 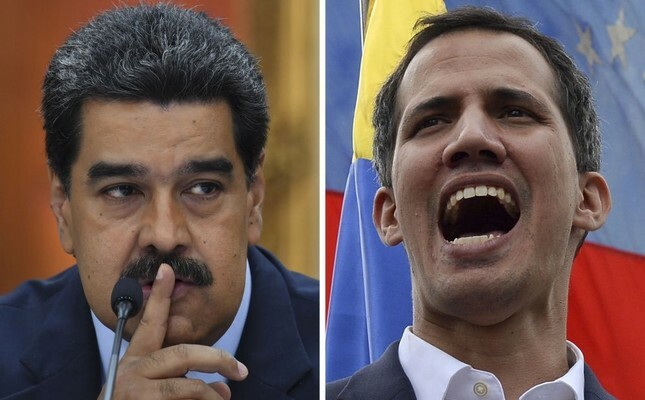 European nations also recognized Guaido as the interim leader until new elections are held after Maduro rejected a European ultimatum to call for fresh polls. Maduro, last week, warned that leaders in Washington were motivated by the desire "to get their hands on" Venezuela's massive oil reserves, "as they did in Iraq and Libya." Venezuela has been rocked by protests since Jan. 10 when President Nicolas Maduro was sworn in for a second term following a vote boycott by the opposition. Tensions climbed on Jan. 23 when Guaido declared himself interim president, but Maduro has so far refused calls to step down. He has accused the U.S. of orchestrating a coup against his government and said he is open to dialogue with the opposition. The U.S. has led international efforts to apply economic and diplomatic pressure on Maduro, including sanctioning the country's state-owned oil company and a joint venture with its Nicaraguan counterpart.